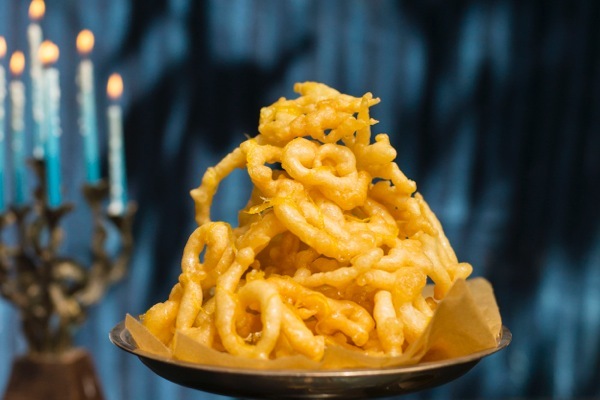 These funnel cakes are essentially a fried dough and like doughnuts of all kinds they are one of those sweets that really should be eaten as soon as they come out of the hot oil, so plan accordingly. You will be rewarded with crisp, sweet, airy deliciousness. This recipe as well as the Blood Orange and Olive Oil Polenta Upside Down Cake is from The Seasonal Jewish Kitchen by Amelia Saltsman. Her book brings a farm-to-table approach to all that the Jewish kitchen has to offer, with its liberal use of herbs and spices, grains and vegetables as well as dairy, meats, seafood and poultry. These fried dough confections are perfect for Hanukkah; the lemon syrup really sets them apart. 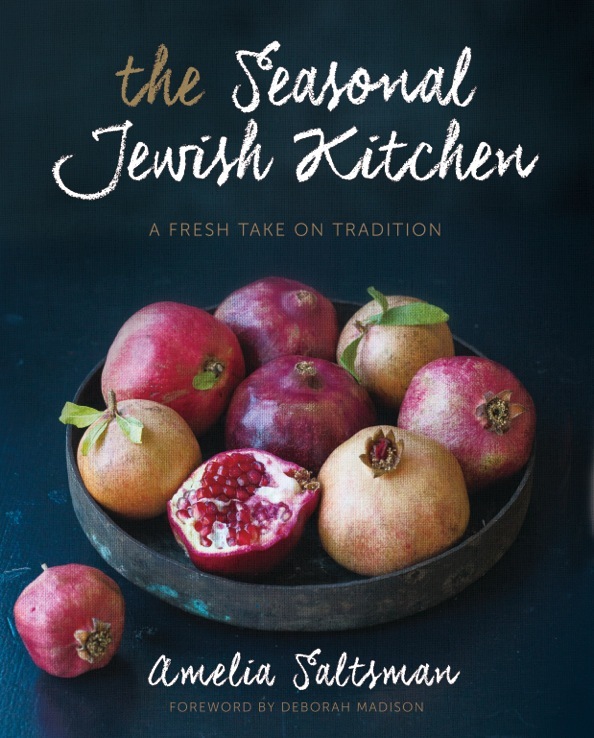 Excerpted with permission from The Seasonal Jewish Kitchen, by Amelia Saltsman. Published by Sterling Epicure, 2015. Photos by Staci Valentine. 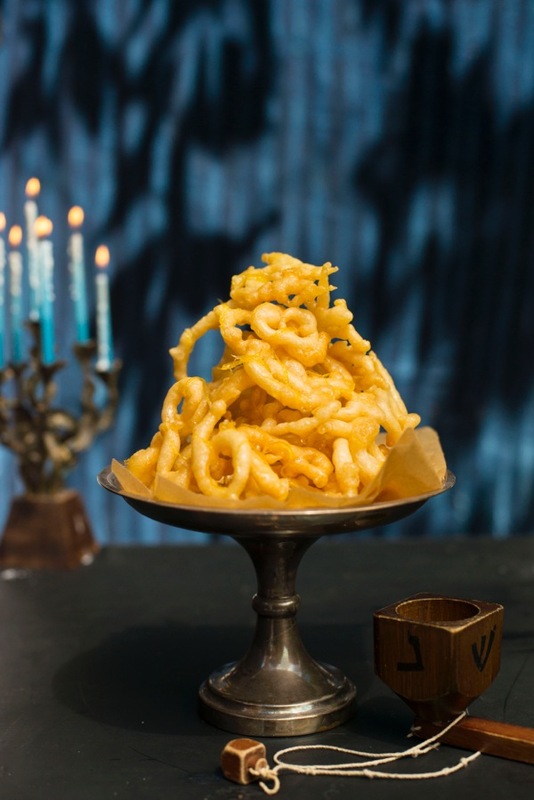 Also known as jalabi, these crisp fritters, or funnel cakes, were adopted by Iraqi Jews centuries ago as the perfect fried food to celebrate the miracle of Hanukkah. Traditionally soaked in sugar syrup, they are infinitely more wonderful when infused with a tangy lemon syrup. It takes only a few minutes to whisk together the forgiving batter the night before you want to serve zengoula, and the pastries can be fried early in the day you want to serve them. Or, make the frying a Hanukkah party activity. My cousin Elan Garonzik has vivid memories of our grandmother turning out perfect coils, which is how they’re sold at Arab bakeries like Moutran in Nazareth and Jaffa. That takes a bit of practice. Free-form Rorschach-like shapes—sea horses, dolphins, geese—that magically appear as they bubble up in the hot oil are just as delicious. You will need to begin this recipe at least six hours before you want to serve the zengoula. TO MAKE THE DOUGH: In a small bowl, stir together the yeast and ¼ cup (60 ml) of the warm water and let stand in a warm place until the mixture bubbles, about 10 minutes. In a medium bowl, using a fork, stir together the flour, cornstarch, and salt. Stir in ½ cup (120 ml) of the warm water and the yeast mixture. Then slowly stir in enough of the remaining ½ cup (120 ml) warm water until the dough is lump-free and the consistency of thick pancake batter. You should have 1½ to 2 cups (360 to 480 ml) batter. Cover the bowl with plastic wrap and refrigerate until doubled in bulk, at least 6 hours or up to 24 hours. The dough will be loose and spongy and have a yeasty aroma. TO MAKE THE FRITTERS: Scrape the dough into a 1-gallon (4-L) resealable plastic bag or large pastry bag fitted with a ¼-inch (6-mm) plain pastry tip and set the bag in a bowl for support. Let the dough stand for about 15 minutes before frying. Line a large plate with paper towels. Place the prepared plate, tongs, a small spider or slotted spoon, the syrup, and a tray to hold the finished fritters near the stove. Pour the oil to a depth of 3½ inches (8.5 cm) into a 4- or 5-quart (4- or 5-L) pot, wok, or electric fryer and heat to 375°F (190°C). If using a plastic bag for the dough, snip ¼ inch (6 mm) off of one of the bottom corners, cutting on the diagonal, to create a piping tip. Roll the top of the pastry bag closed to move the batter toward the opening. Don’t worry about air pockets. Pipe a bit of the batter into the hot oil. The oil should bubble around the batter immediately. If it does not, continue heating the oil and try again. Pipe the dough into the hot oil, creating 3- to 4-inch (7.5- to 10-cm) coils or squiggles, letting gravity help push the batter out. Be careful not to crowd the pan. Fry the dough, turning once at the halfway point, until bubbled, golden, and crisp, 4 to 5 minutes total. Use a spider or slotted spoon to fish the fritters out of the oil, drain them briefly on the towel-lined plate, and then drop them into the syrup for a moment or two, turning them to coat evenly. Lift them out of the syrup and transfer them to the tray in a in a single layer to cool. Repeat with remaining batter, skimming any loose bits of dough from the hot oil between batches to prevent burning. Scrape any batter that escaped into the bowl back into the pastry bag to make more pastries. The cooled pastries can be piled on a platter. Pour any remaining syrup over the top. The fritters taste best served the same day they are made, although they will hold their crispness overnight. Store loosely covered at room temperature. A couple of 2-inch (5-cm) chunks of raw carrot added to the frying oil act as magnets, attracting all those little brown bits that might otherwise burn and impart an acrid taste to the oil. It’s an old-fashioned trick that works!